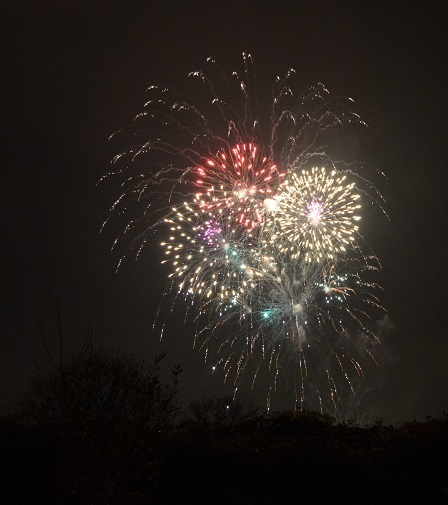 One of the (many) plus points of allotments is that, come Bonfire Night or thereabouts, you’ve got enough space to have a ruddy great fire. The work parties generate a lot of wood for burning, and all the raised beds we use to hoist our crops off the claggy clay have a tendency to rot. Only the really bad stuff is left for burning – many of us are proper scavengers and will hoik out & squirrel away any boards that look like they have more than a couple of months’ life in them. Someone stuck fig tree prunings on the heap, so I’ve nabbed a couple of branches to have another go at growing from cuttings. The bonfire gets built on the day, to avoid anything setting up house in it. With mulled wine, cake, 2 BBQs going at full pelt and fireworks from the local display conveniently almost next door it’s a really nice social. 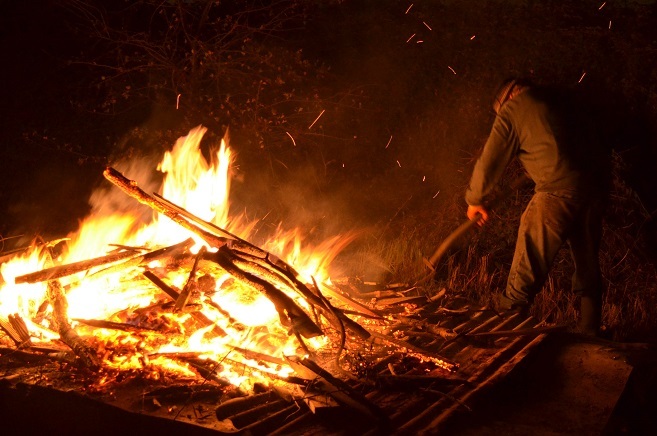 Particularly if people bring their homemade tinctures…This year the woodpile included at least one rotten shed, which went up in a wall of flame just as the wind changed. It felt as if I nearly lost my eyebrows. The fire will smoulder well into the next day, but by the end of the weekend there will be a massive amount of potash for spreading under fruit bushes. On the plots my garlic is still a no-show. The weather is still incredibly mild but also damp. There are a lot of puddles around and my leeks already have rust. One thing I am learning about plastic greenhouses is that they are WET at this time of year. I cannot seem to keep it dry and the plants inside will soon grow mouldy if I can’t find a better solution. I ripped out the unproductive cucamelon as some of it had gone a little fluffy. I’ll try uncoupling the autovent and put on the standard opener to get more air in there. So far everything is ok.
At home chilli, bean and fennel seeds are drying, kiwano seeds have been fermented and are drying – just a squash or two to open, the aubergine to ripen and my contribution to the seed circles are done. My Black Coco bean seeds have been sent off to the Heritage Seed Library – one very fat envelope, and I hope they make it into the catalogue one day. The next job is to go through the seed boxes and bags and update my spreadsheet so I know what I have before planning next season. I tested the sloe/chilli vodka, and even half one of those chillies was too much. It needs a fair bit more vodka and sloes to balance it out. Thanks to #wastenot on Twitter, last week I got 2 big bags of quinces. Proper ones. 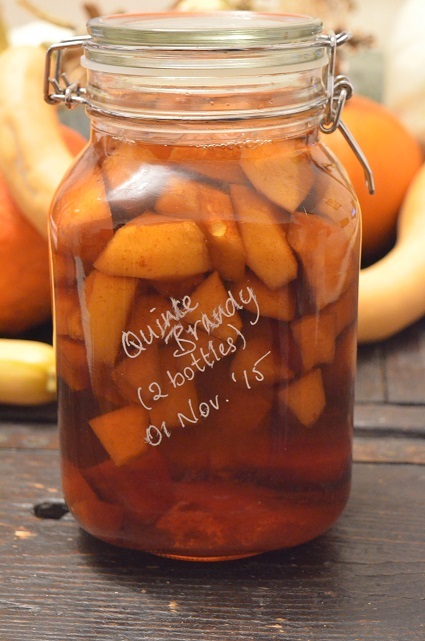 So a big jar of quince brandy is infusing away and I might make a couple of jars of jelly for toast and stew the rest for crumbles. I’ve fermented some of the seeds as a bit of a punt – now also drying and will go in the freezer for a couple of months for a pretend ‘winter’ to see if that helps germination. I’ve also started a Growing Notes section as a place to collect experiences of growing specific edibles. Currently it has a page each on achocha, kiwano, oca and saffron, with a couple of others in the pipeline. We had a halloween evening round a great big BBQ with a nice fire. We made cute lanterns from old jars and people bought food. Was lovely. What d’ye mean ‘real’ quinces Miss Randall! Was going to offer more, now I just might make a crumble if you let me know how one stews a quince.. Do I have to remove outer somewhat obstinate skin? Whoops! And yes, peel and core them, stew with some water as they are quite dry. Adding apple helps get a more pureed texture. And people say gardening quietens down in winter!